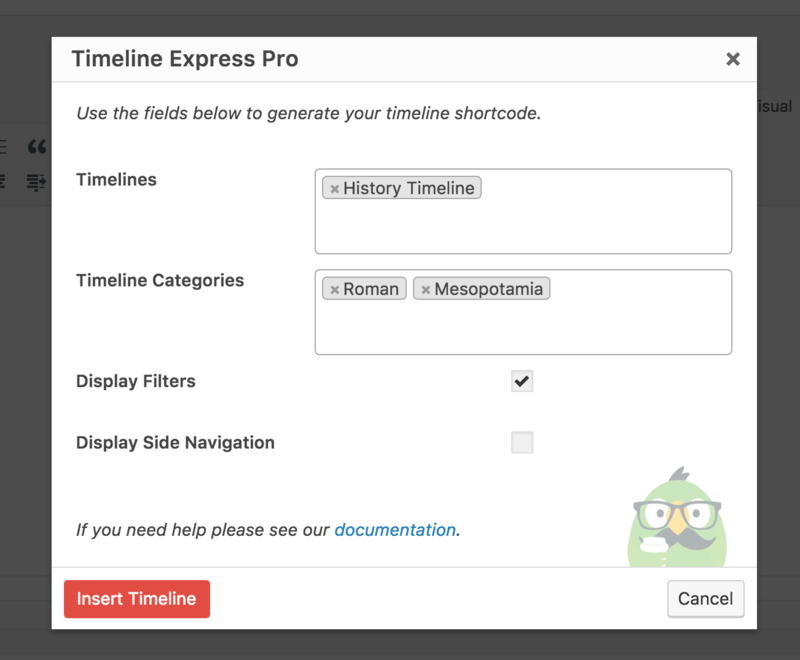 Timeline Express Pro v2 brings some awesome new features into Timeline Express. 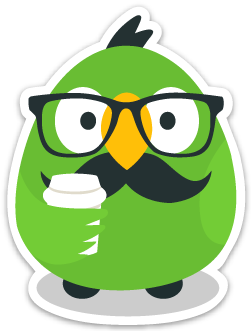 Many of the new features were highly requested by our users over the past few months. We worked hard to bring these new features into Timeline Express Pro, and we know you’re going to love them. With the new changes, you can now fully customize your timelines with individual icon & container animations, built-in styles, additional style pickers, announcement video banners, announcement banner popups and a ton of other features! This is the largest update we’ve ever pushed out to Timeline Express, and we’re extremely pleased with the outcomes. Take a look at an overview of some of the new features below. 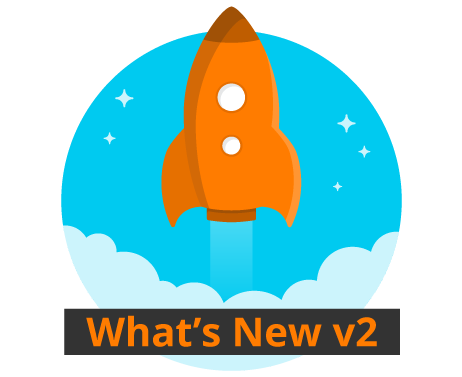 The v2 update is now available to all of our pro users! The first thing you might notice is the new icons we’ve introduced into the plugin. The ‘Timeline Express’ admin menu and the TinyMCE shortcode generator button icons have been updated to our new and improved rocket ship icon. This should improve branding between the Timeline Express plugin and the Timeline Express website, so you’ll recognize what it is at first glance. Another major update is the new shortcode generator. 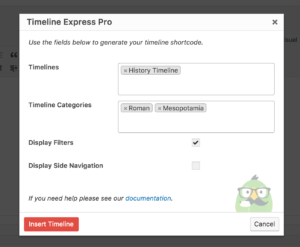 We went ahead and re-wrote the entire shortcode generator within Timeline Express. We did this for two reasons. The first was, our original shortcode generator was custom – and thus was a lot of code to maintain and took quite a bit more code to extend with our add-ons. Second, we wanted to use the native WordPress TinyMCE popups, as they are responsive and a whole lot easier to extend and customize. 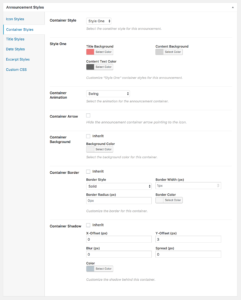 Using the native TinyMCE controls also ensures that our shortcode generator will work well with other plugins and themes, and will continue to work with future releases of WordPress core. In Timeline Express Pro v2 all of the new features introduced have been done so in modules. These new modules can be loaded or unloaded as needed, so if you find that any of the new features are unneeded, or just add additional options you may not use, you can unload them so they aren’t used on the site at all. If you’d like to disable any of the new modules, you can do so using our built-in filters. Take a look at our documentation article, ‘How to Disable Timeline Express Module’. Our new ‘Styles’ module does exactly that – it enables a ton of new styling options for your announcements. We’ve added styling options for everything in the announcement container on the timeline. There are sections for Icon, Container, Title, Date, and Excerpt styles. 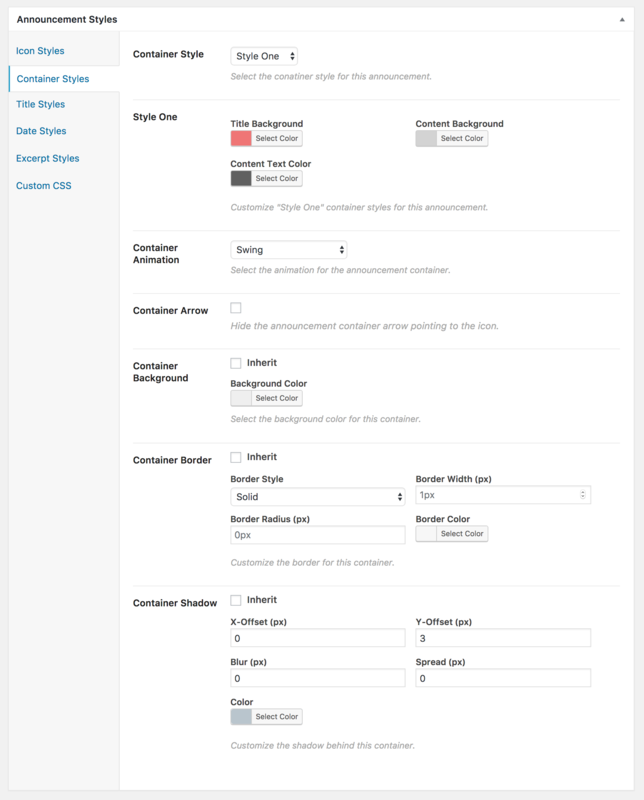 We’ve also added a Custom CSS section for you to add some fancy CSS code to – if you need. Users have been asking us for some time how they can enable image previews when clicking on the announcement banner image on the timeline. This was previously possible, but only through the use of custom code, which was neither user-friendly nor sustainable. We went ahead and built in a module with a new option on each announcement item allowing you to enable banner popups on a per announcement basis. When the image or video thumbnail is clicked in the announcement, a popup will appear displaying either the video or image. You’ll find the new option on the announcement edit screen, just below the ‘Associated Timelines’ options. One of the most requested features we’ve received since inception is the ability to display the years in the sidebar, or on the side of the site, to allow users to quickly scroll up/down to the start of the year clicked. We’re extremely pleased to finally have built this feature into Timeline Express Pro v2. We’ve introduced a few new shortcode parameters to allow you to fully customize the sidebar navigation, but at its very core, all you need is a sidenav=”1″ parameter on your existing shortcodes to enable it. Take a look at the brief demo we set up, showing off these features. In Timeline Express Pro v2 users can now use custom font icons of their choosing. We were able to achieve this through the use of another one of our products, WP SVG Icons. WP SVG Icons allows users to build custom icon packs using the icon generator at Icomoon.io. This means users can design custom icons in an application such as Adobe Illustrator, and then generate a font icon that can be used on their site. In short, we’ve integrated the two products, so when a user has WP SVG Icons installed alongside Timeline Express Pro, the custom icons uploaded into WP SVG Icons will be available to select from the Announcement Icon drop-down list. You can now safely upgrade to Timeline Express Pro v2 from your WordPress dashboard if you have a valid license entered onto the license page. Upgrading should be a seamless, painless process since everything is backward compatible with previous versions. New and existing users can get an additional 20% off at checkout on Timeline Express Pro and all of our add-ons using the code TIMELINE2 at checkout. The discount code is good for license renewals and new purchases until July 31st, 2017 – so act quickly!